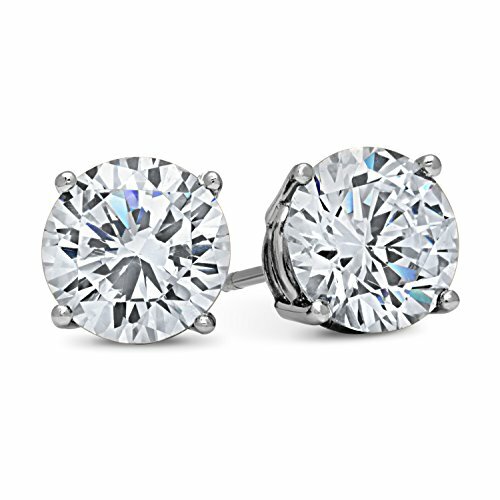 CRAFTED IN THE USA FROM SOLID 14K WHITE GOLD - These earrings are crafted to the highest standards in solid 14K white gold, right here in the USA, and are made to last. SIZE INFORMATION - The diameters are: .50ctw - (.25ct - 4mm each) / 1ctw- (.50ct -5.25mm each) / 1.5ct- (.75ct - 6mm each)/ 2ct- (1.0 ct - 6.5mm each) / 3ct- (1.5 ct - 7.5mm each) / 4ct- (2.0ct - 8mm each). QUALITY MATERIALS ONLY - besides being made from quality materials, all our jewelry is fully checked prior to shipping. They also come in a FREE GIFT BOX . OUR 100% SATISFACTION GUARANTEE - You can buy with confidence knowing we will do everything to ensure you are 100% satisfied with your new jewelry. FAST SERVICE & SUPPORT - Should you need us, we are just an email or phone call away. We respond quickly, and will resolve any issues you may have. WE ONLY SHIP FROM THE USA - We don't ship from overseas - ever. All our items ship directly from within the United States to ensure they arrive on time and in perfect condition. If you have any questions about this product by DTLA Fine Jewelry, contact us by completing and submitting the form below. If you are looking for a specif part number, please include it with your message.